I've only read the Bible through once before, and that was a rushed reading in my youth to say been-there-done-that. I've been wanting to study its literary, historical, and spiritual content more closely for a long time, and in the year 2017 I'll start with a literary group reading. Everyone is welcome to join me for some or all of this project. I have several books to help me through this project. The most important is my Bible-of-Choice,The Literary Study Bible, ed. by Leland Ryken and Philip Graham Ryken. It is a "reader's Bible" with reasonable print size and concise literary annotations. So far I'm pleased with it, though I'm holding back judgement until I delve deeper into reading it. I already started reading How to Read the Bible by James Kugel and am enjoying it quite a bit, though its focus is on critical / historical interpretation and not literary per se. The Literary Guide to the Bible ed. by Robert Alter and Frank Kermode is also a fantastic resource. It has an essay on each separate book (or group of books at times), and I will read the essays as I progress through the Bible. I found the introduction to be very dense, though, and from reading reviews it appears that Robert Alter's writing is brilliant but dense. I'm hoping the rest of the essays will be more approachable. The Literary Guide to the Bible suggests reading the first two chapters of Erich Auerbach's Mimesis, since they revolutionized literary interpretation of the Bible. I just happen to have Mimesis on my shelf, so I'll read through those chapters. That leaves the question, do I stop there or do I find one more book to read to help me better understand literary analysis of the Bible? Another promising selection is The Art of Biblical Narrative, which I've read is worth slogging through the dense writing to get to the crux. 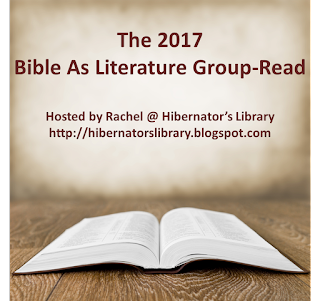 After reading the introduction to The Literary Guide to the Bible, I'm skeptical that I really want to slog through that, though. It was on my Christmas list, so if I get it I'll read it. I'll let Christmas be my guide. Another option is The Bible as Literature: An Introduction by John B. Gabel, Charles B. Wheeler, Anthony D. York, David Citino, and Nicola Denzey. It's a textbook and is apparently pretty clear, though not as brilliant as The Art of Biblical Narrative. Has anybody read good books on the subject of reading the Bible from a literary perspective? Any ideas? These books look so good. I want to read them all! As you know, I find such musings fascinating. I also highly recommend Harold Bloom's Jesus and Yahweh. Oh, yes, that's right. I remember you suggesting that once before. I'll put it on my wishlist. I've read parts of Kugel's How to read the Bible, and thought it was good. The Alter looks interesting, but I don't want to add a 700 page tome to my collection right now. I'd recommend: Living by the Book by Howard G. Hendricks and William D. Hendricks. Thanks Becky! I'll check it out.